Welcome to the adorable Westlake Cottage! 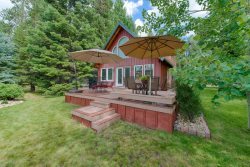 Located just off Warren Wagon and close to town, this home is perfect for your visit to McCall! New to the rental market, this bright and airy 2 bedroom / 2 bath home sleeps 6. Westlake Cottage has an open floor plan and great room. All bedrooms and bathrooms are on the main level of the home- with the laundry room located in the basement (which is in the process of being remodeled to add additional bedrooms and bathroom). The home is well stocked for all your needs, including Cable TV and WiFi. - Master on the main floor with Queen size bed, and flat screen TV. All amenities: Note that all amenities are subject to change without notice and are not guaranteed. We will always do our best to offer all our amenities listed, but at times this is our of our hands and we can not give any discounts or refunds based on an amenity not being available during your stay.